Urban area of Washington Beach, as viewed to the northwest in GTA Vice City. The beach area of Washington Beach in GTA Vice City. Washington Beach is a small district in Vice City. It is the smallest district in Vice City. The Washington Mall, a small open-air mall, is located in the area. Located in between Vice Point and Ocean Beach, the district is only a few blocks long. 1102 Washington Street is located here, right across from Ken Rosenberg's office. The district has several small shops, all inaccessible. This is where Tommy Vercetti begins his adventure (in Grand Theft Auto: Vice City). 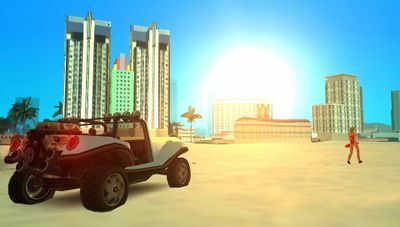 The area hasn't changed significantly between the events of Grand Theft Auto: Vice City Stories and Grand Theft Auto: Vice City, although the mall has yet to be constructed in GTA Vice City Stories. This page was last modified on 20 November 2011, at 00:56.